Why You Should Test Your Cannabis For Terpenes – True Northwest, Inc.
Terpene profiles are becoming increasingly popular among consumers of recreational and medical marijuana. They offer unique attributes of aroma, taste, color, and bind and interact with THC and CBD in different ways, enhancing the experience. Over 100 types of Terpenes have been identified in cannabis through scientific analysis. Here are the 6 Most Common Terpenes in Cannabis, courtesy of Leafly. 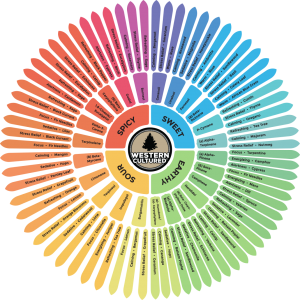 Check out this cool Terpene Flavor Wheel, courtesy of the folks at Western Cultured.